Just so you know, we’re continuously trying to improve the coding experience of everyone who works with XAML. ReSharper 7.0 that we have released a couple of months ago was highly focused on supporting Windows Store application development and quite frankly, didn’t contain many changes targeted at a broader crowd of XAML pros. Come 7.1, it’s time to make everyone happier, even if you’re not very much into Windows Store apps right now. The main challenge that we’ve solved in ReSharper 7.1 was to come up with fast, smooth and smart automatic code completion in XAML markup. Providing code completion lists in XAML is sometimes a non-trivial task: for example, WPF actually exposes hundreds of public types with lots of members like attached properties and events that should be taken into account while building completion lists. By virtue of reviewing our caching strategies in ReSharper 7.1, we ended up with a nice performance boost in code completion and whole XAML support as well. If you’re looking for the full list of possible types with attached properties/events, just invoke symbol completion (Ctrl + Space). This behavior differs from that used in other languages where automatic completion works pretty much the same as symbol completion. However, it makes XAML lookups much cleaner and more precise in most cases. If you happen to find this behavior confusing, please vote or leave a comment under this issue. A plethora of other small improvements has been implemented in code completion for XAML, including fixes in the calculation of expected types and improvements in Windows Workflow Foundation (WF) projects. As expected, XAML code completion in ReSharper reacts to type changes immediately, without requiring to build your project. The second important area that has been improved for XAML developers is typing assistance. If the suggested type doesn’t fit, you can trigger import completion or enter a new type that can then be declared from usage. ReSharper provides code completion and other features despite <DataContext property being of System.Object type. Similar bindings with RelativeSource mode are also supported. ReSharper 7.1 now highlights naming consistency issues in XAML markup just like in other supported languages and offers actions to fix naming. 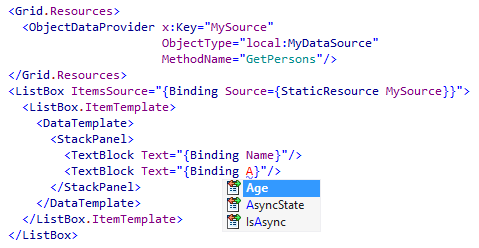 Naming rules are configurable for XAML fields, resources and namespace aliases. In future versions, we’ll be looking to provide adequate tooling without enforcing any particular naming conventions. Unused XAML resources are no longer highlighted with gray in their entirety: only resource keys are highlighted. Support for markup extensions has been rewritten to solve a bunch of issues and provide improved code completion. Here’s the full list of XAML-related fixes implemented for ReSharper 7.1 this far, and we still have quite a bit on our XAML support improvement agenda. As usual, any feedback on your experience with ReSharper XAML support is highly appreciated! To test drive the recent changes, make sure to download a fresh ReSharper 7.1 EAP build. This entry was posted in How-To's and tagged EAP, ReSharper, ReSharper 7, XAML. Bookmark the permalink. Any chance to fix RSRP-232569 for 7.1 ? It was fixed for 6.1 but was back in 7.0. @Jean-Marie Pirelli, thx for your feedback! Will check RSRP-232569 issue soon, sorry for the inconvenience. Wow! There’s an amazing amount of awesomeness here. Nice, nice work, guys. In the past, I’ve had trouble with the data context type annotations. I can tell R# that my UserControl’s DataContext is of type MyCollectionViewModel, but then if I add an ItemsControl and bind it to my viewmodel’s Items property, R# complains about the bindings inside my ItemTemplate — it still thinks those DataContexts should be of type MyCollectionViewModel, rather than realizing they should be of whatever type is inside the MyCollectionViewModel.Items collection. I haven’t taken the time to write this up in YouTrack yet. Has any work been done in this area? If this is already fixed, great — if not, I’ll try to write up repro steps at some point. It may not work properly with custom controls non-derived from ItemsControl (someone of popular WPF control vendors introduces custom ItemsControl type, for example), but you can still help R# specifying DataType property of DataTemplate. If you have any troubles with binding type calculation with some type of controls or any other issue with XAML – our youtrack is the great place to report it, thanks! RSRP-232569 is now fixed in the EAP. Thanks a lot ! @Alexander Shvedov, nope, the ItemsSource support is still busted — it’s still showing warnings on valid code, trying to use the parent DataContext type instead of the element type. Looks like it may only be a problem with ItemContainerStyle. I wrote this up as RSRP-335261.